Tonight was the George F. Will event at Politics & Prose, and I did not ask him to sign my Newsweek as I quipped last week but I did get there early enough to get a seat. He didn't get quite the audience of McClellan last week, but it's easy to fill a room with Bush-haters. An intellectual conservative is a harder sell. Even if you don't share George Will's sensibilities, it's hard not to appreciate his wit. I tend to do both. He took Q&A from the audience after offering some well-articulated opinions (his Doctor saw his Medicare card and said, "Great! Now we'll send your bills to your children.") He is a conservative, but I think of him as more of a libertarian. When one questioner asked about teaching Intelligent Design in the classroom, Will compared it to teaching alchemy in a Chemistry class. He's smart, he's funny, and I'm in awe of his command of the English language. At the end of the event, I looked around for a bit (how cool is this - they have my U of I professor's book in stock!) I tried to decide if I wanted to look like a dummy and ask Mr. Will for a picture or not. I didn't feel entitled to take up his time when I wasn't shelling out for his book, but I eventually decided it might amuse my dad. Surely he'll feel better about me being so far away if he sees me hangin' w/George F. Will. There were only a few people left in line when I mustered up my nerve, but the guy in front of me could not stop talking when it was his turn. It prolonged my wait, but it was quite endearing. The man was buying four books and had them signed and personalized for friends while he repeatedly expressed his appreciation for Will's work. 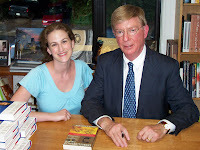 After all four books were autographed, he handed George Will a gift he'd brought him - a book by another author that he thought he would enjoy. Yeah, it took a while - but it was fun to watch the enthusiasm; and what the hell do I have to complain about? I wasn't even making a purchase. Before that photo came to be, the guy in front of me heard my question and immediately turned to me and said, "You want a book? I'll buy you a book." He insisted that I needed one and my Iowa hospitality prompted, "Oh no, I couldn't accept that. A picture is fine... it's for my dad." But the man was a dedicated fan and wanted to share his favorite author with anyone who wanted to read it... even if it's just the young lady standing in line next to him. I was shocked by his reaction and didn't know what to say. I protested again until George Will nodded at me and said, "Take the book." "Okay, if George Will says take the book, I will take the book." Did the enthusiastic fan take the picture for you too? What a nice person!